Off the bench - D'Marques Tyson (JR, 6-5 215), Ray Barreno (SR, 6-10 250), Rashad Jackson (SO, 6-3 180). Off the bench - E.J. Boyce (SO, 6-2 170), Jalen James (JR, 6-4 175), Gary Williams Jr. (SR, 6-5 215), Terrell Brown (FR, 6-2 160), Brandon Mitchell (JR, 6-6 210), Cody Schwartz (SO, 6-8 210), Ryan Singer (SO, 6-10 235). 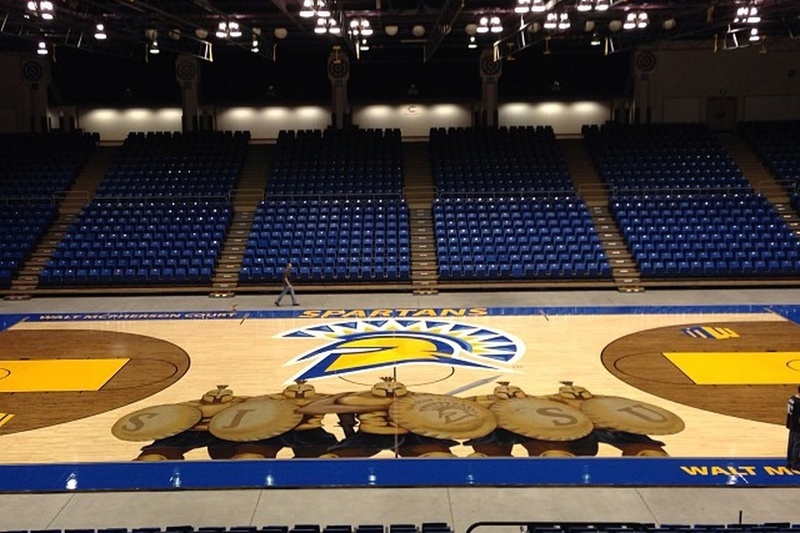 Hard to tell what SJSU is going to be like this year. They beat NAIA Div. II and NCAA Div. II teams in exhibition, and laid a dirty whipping on West Coast Baptist (NCCAA) on Saturday in their regular season opener. Gary Williams, Jr. missed the last two games to a hip injury but will likely return against the Pilots. Highly regarded freshman recruit Keith Walker III will redshirt. Starting five pretty much set in stone, it'll be interesting to see how many guys get significant minutes behind them - so far, it's been everybody. The 1-351 ranking done by CBS had SJSU at #336. Spartans were picked to finish dead last in the Mountain West preseason poll. But this team started three freshmen last year and had some nice wins - USD on a neutral court and then four wins in Mountain West including Fresno State and Boise State, all on their home court. Kenpom has this as a 50% tossup for good reason. A tight game should be expected, and I wouldn't be surprised at any result tomorrow night. Many teams have a history of getting up for the big opponents and taking the lesser opponents too much for granted....the Pilots are no exception. Many may recall that two years ago the Pilots trailed by as many as 13 points in the second half in San Jose before rallying behind a game tying jumper from Voldy with clock winding down, before winning in overtime. KB had 22 points and Alec had 24 in a game that was really awful to watch until the Pilots made an 18-5 comeback in the final 10 minutes and then outscored the Spartans 11-6 in overtime. I bring up this game because it was the road opener for the Pilots, and it was against a SJSU team that was ranked 347/351 by KenPom. The Pilots were ranked 122 at the time. Tuesday's game has the Spartans ranked at 227 and the Pilots at 160. UP is probably the better team, but it's the first time away from home this season. In the past, playing at San Jose has been like playing on a neutral court....there are a few SJSU fans and a few UP grads who live in the Bay Area who come out to watch. Two years ago there was no band and no excitement....let's hope the excitement comes from the UP bench this year. DoubleDipper wrote: In the past, playing at San Jose has been like playing on a neutral court....there are a few SJSU fans and a few UP grads who live in the Bay Area who come out to watch. Two years ago there was no band and no excitement....let's hope the excitement comes from the UP bench this year. All 3 games SJSU has played this year they have scored more than 100 points. This will give us a good test for our defense and see where our depth is at. It is hard to get to 90 points, let alone 100 points if only 5 players score more than 1 point like the UCR game. I m not sure what to expect with this being the first road game of the year. I think the Pilots will win a close game with the score being in the 80's. 2002Pilot wrote: I m not sure what to expect with this being the first road game of the year. I think the Pilots will win a close game with the score being in the 80's. If you were a betting man, you'd probably take the "over," as Las Vegas has the over/under at 145. The over sounds like a decent bet...if I were a betting man. Live stream working for anyone, or is it just down for me? Going here https://livestream.com/sanjosestate shows the video stream as off air. Don't try watching the live stats and listening to the audio unless you want to know the future. The stats are well ahead of the audio -- at least for me. The video feed just kicked in for me.... finally. Video intern: "How come this light is red? It's usually green.".... "OH CRAP". Flips stream on. Looks like it's up now! EDIT: Shot clocks are not working. The solution is to have the PA Announcer say when there are 10 seconds and 5 seconds left, and then do a countdown from 5 to 0. I don't think I've ever seen that happen before. Do they honestly not have the small portable ones to set up behind the hoops? Maybe we'll see them bring the little ones out at the half. Looks like Smoyer is allowed to shoot from the elbow. Must just be Barreno that's not allowed based on the exhibition game. Looks like they did bring some out, but they aren't working. Hopefully they'll get it squared away. Also, Hartwich, Barreno, and Smoyer all have two fouls already. Hopefully that won't turn into a big issue in the second half, because we are pretty thin down low. Just looking at the shot of the stands—does not appear that they have 500 in the building and that may be overstating it by a pretty goof factor. I was wondering how many seats out of view and if they were not permitting people to move down...why not? I spied at least one of the free shirts Portland 30/Porter 30 shirts from the last game. Nice little win for the Pilots, and I'd imagine the top of the WCC will be happy to see a road win over a Mountain West team. And whoever set the over/under at 145 is good at their job! Pilots took control with a 13-0 run in the 2nd half. SJS tried to stay close with some 3's, but they eventually stopped falling, and Pilots continued to execute and score. Gabe had 24, Alec had 20 and Jazz had 16. Jarrell made some key plays in the 2nd half and got 11. D'Marques was 2-5 from 3pt. Rebounds, turnovers and assists all pretty even for both teams. Big difference was UP shot 50% (61% in 2nd half) while SJS shot 36% (33% in 2nd half). The box score shows Ray and Philipp combining for 25 minutes, and Joseph playing 5 minutes......question, did Gabe play 15 minutes (out of his 40) at center or did he play 10 minutes there while Joseph played center? I firmly believe the best offensive lineup has Smoyer or Marshall at the 4 and Taylor at the 5....but Hartwich is the better disruption in the middle on defense. In crunch time, the line-up was Alec, Jazz, D'Marques, Jarrel and Gabe. DoubleDipper wrote: The box score shows Ray and Philipp combining for 25 minutes, and Joseph playing 5 minutes......question, did Gabe play 15 minutes (out of his 40) at center or did he play 10 minutes there while Joseph played center? I thought Smoyer was playing the point at first...he tried to lob an entry pass down low to Tyson on the first possession after he came in! Smoyer's playing time is going to increase. He can catch a pass for one. He seems to have better offensive skills and plays decent defense as well. Great game from Marshall. We need more of that! Smoyer only played 5 minutes, but he was better than the other two centers. He should at least move past Barreno in the depth chart. That high post play that we keep running is a disaster. It has resulted in turnovers more often than not. Let's move on from that. Wintering/Johnson/Taylor are emerging as a nice triple threat on offense. Kudos to Taylor for playing 40 minutes and only committing 2 fouls.